We knew from the start of our planning that we would take our cat Zora with us to France, we just weren’t sure how to make that happen. Many people were surprised when we told them she was coming with us, but it seemed the obvious choice to us. No matter how difficult it might be to bring her along, she was part of the family and we couldn’t leave her behind. There were a few major considerations involved in this decision; first of all, we had to factor her presence into our apartment hunting process (see Finding an apartment in Paris), and secondly, we had to find a way to physically transport her to France. Never having taken her with us on other travels, we weren’t familiar with the options available to us. I had heard about cross-country pet transportation from friends, but didn’t know much about overseas relocation. We were assuming that using a pet transportation company would simplify the process for us, as they would have all the information about entry requirements and the know-how to get Zora to France safely. We also didn’t know what state we’d be in by the day of our departure, and thought it would take a load off our minds to leave Zora’s care to professionals. Our opinion about this course of action changed dramatically when we found out how much these companies charge to provide this service. From the Web sites we looked at, it seemed rates began at about $1000, and only went up from there. This was completely outside our price range, and we knew we’d have to come up with a different solution. Using one of these companies might have made sense for us if: a) our moving costs were being paid by an employer; b) we were moving multiple animals; or c) we were moving to a country that requires a period of quarantine (France doesn’t have this requirement for cats from the U.S.). Since none of these were true for us, we opted for Plan B. Plan B was to find a pet-friendly airline that would allow us to bring Zora with us on our flight. In the course of my research, I found that there are many airlines that allow small pets in the cabin or cargo hold, but there was an additional complication. As I detail in the post Dealing with airfare sticker shock, it was going to be hard to find a reasonable fare to France for me and Joe, and being limited to pet-friendly airlines might have meant much higher ticket costs. Fortunately, we found a good fare on Northwest Airlines which turned out to have a very generous pet policy. Northwest allows small pets to travel in the cabin (although it has a limit on the number of them allowed per flight) or in the cargo hold if necessary. Going in, our strong preference was to have Zora with us, since we didn’t know how she would react to strange conditions in the hold. However, when I called to make the reservation for her (this has to be done separately), the agent told me that although there was space in the cabin on the first leg of our trip, the second flight had reached capacity for in-cabin pets. I was very disappointed, but went ahead with the cargo reservation since we had no other option. I was even more nonplussed when the agent told me that Northwest has an embargo on carrying pets in the hold if the weather is too warm (and we were traveling in late June). I had nightmare visions of turning up at the airport with all our stuff and being told we’d have to find another way to get Zora to France. In desperation I asked the agent if they had a waiting list for the second flight; he recommended that I try calling back in a few weeks to see if anything had opened up. In the meantime, he made the reservation and charged me a portion of the fee ($80) for Zora with the remainder to be paid when we checked in for our flight ($150 in total). For the next few weeks we worried about how things might turn out, hoping but not expecting that something would have changed by the time we called Northwest again. Amazingly, the next time we called the agent told me that it was possible to bring Zora in the cabin on both flights, she’d only need to change our seat assignments on the second flight so that there would be space for Zora’s carrier in front of us. Needless to say, we were extremely relieved that Zora could remain within arm’s reach for the duration of the flight, and that we wouldn’t have to wonder about her comfort level in the cargo hold during that time. The next step was to purchase an airline-approved carrier for Zora since the carrier we had was not suitable. 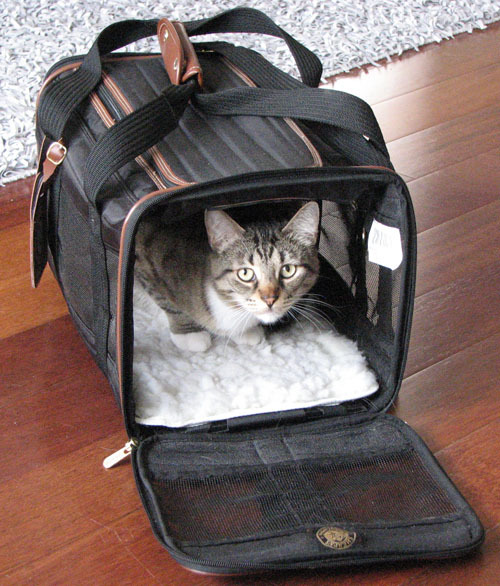 Pets traveling in the hold need to have very sturdy, hard-sided carriers to ensure their safety, but because Zora would be with us in the cabin, we decided to buy a much lighter, soft-sided carrier that would be easier to fit under the seat in front of us. We looked at quite a few carriers before deciding to buy a Sherpa bag because it seemed to be well-made, and it met the airline’s requirements for size, construction (ventilated on three sides), and material (leak-proof bottom). The true test came when we brought it home and Zora took to it immediately; in fact, it’s still her favorite place to hide in our Paris apartment. The fact that the Sherpa bag was lighter than a hard-sided carrier was useful to us not just for the ease of carrying it around, but also because we worried that Zora would not be allowed on board if she weighed too much. We had read on Northwest’s Web site that the weight limit for carry-on pets was 15 pounds (for the pet and the carrier), and Zora’s weight, plus that of a carrier, might be slightly over that limit. Although we spent a lot of time fretting about that last pound, in the end we didn’t have a problem when we checked in; the weight of our luggage was carefully scrutinized, but the agent didn’t ask us to put Zora on the scale. We don’t know how we got lucky, but it could be that since the carrier (and our pet) was the right size, they didn’t question how much it weighed. Many people asked us if we would be giving Zora any medication to calm her down during the flight, but after reading different recommendations online, we decided it would be safer to forgo it. Judging from her past behavior, we thought she might make a commotion at first, but after a while she would settle down and stay calm for the rest of the flight. We knew she would often spend an entire day sleeping/resting in the exact same spot in our apartment, and believed she could adjust to staying in the carrier throughout the trip. On the morning of our departure, we offered her a little bit of food and water about three hours before our flight, as the airline recommended, but she seemed too nervous to eat or drink anything. We hoped she would be able to make it through to Paris without more food, and thought we might try to give her a tiny bit more water later on in the day. As we brought her to the airport, she seemed to like traveling in the new carrier better than the old one because she could see out the ventilated sides. Everything went well at check-in, and to our suprise, they didn’t ask us to pay the remainder of the pet fee because we ended up paying extra fees for our overweight luggage! Going through security, Joe had to take her out of the carrier and bring her through the metal detector, but she behaved perfectly well and he didn’t incur any injuries. We had quite a wait before our flight, during which Zora was mostly calm, although she still wouldn’t drink the small amount of water we offered her. When we finally got on the plane, she didn’t seem to like going under the seat, so we tried to comfort her by petting her through the top of the carrier (it has a zippered opening for this purpose). She took this opportunity to try to squeeze out through the tiny hole we had opened, but we couldn’t take her out at that point. She seemed to settle down though, and the rest of the flight was uneventful. On the next leg of our journey (a much longer flight), she again tried to push out through the top of the carrier once we had it under the seat, but then calmed down for the rest of the trip. In fact, she was so quiet and still that I kept checking on her to make sure she was still breathing! When we finally got to Paris, she seemed none the worse for wear as we took her out of the carrier for a quick cuddle and some water before we made the trip to our new place in the city. She had survived, and we had survived, what could have been a much more stressful experience for all three of us. I was offered an opportunity to go to Australia by my job and I had to turn it down because it was short notice and they have really drastic rules about taking pets there. It would take 5 months to get the license to fly her there than there is a 5 month quarantine perdiod. I may have the opportunity to go to France next year, and I will have to think about my cat at that time as well, was there a license required? what kind of paper work did you have to take care of ahead of time? Great looking cat by the way. We have a separate post on the site about the administrative details involved with bringing a cat to France which you can check out here. I think it will answer your questions. HI, I was wondering about the cat’s bathroom use during this whole ordeal? My cat likes to pee if she gets really angry at me and I don’t know what I’d do if she did that on the plane! Cat pee is the worst thing ever. We’ve only ever traveled long-distance with Zora the one time (when we moved here) and luckily we didn’t have any peeing problems on that occasion! I don’t know what to recommend, other than choosing a carrier that is leakproof, and having some kind of absorbent material on the bottom (as you can see in the photo above, our Sherpa carrier has a sort of fleece insert). When we flew with Zora we also brought along extra towels, which we didn’t end up needing, and in your case, since you have a strong suspicion that your cat may “act up,” maybe some baking soda or talc that could absorb any mess and neutralize the smell a bit (although I’m not sure how your cat may react to that, so may be best to ask your vet about it too). How much airline/transpo total cost did you incur for 1 cat? I have 2 cats that I am planning to take with me to France. Thanks. @Amor As I mentioned in the post, the fee that Northwest charged us to bring our cat with us was $150 (although they later waived $70 of that). But, since it was three years ago (and Northwest doesn’t even exist anymore!) I don’t know what current rates might be for various airlines. It would probably be best to call the airline you’re considering directly. The other costs we incurred were for the carrier we bought, vet fees for a rabies shot and health certificate (see this post for more details about that), and $24 to get the certificate signed by a USDA-certified veterinarian. Again, these costs have probably changed since we made our trip (and the regulations may have too), so I’d suggest that you do some research about the current requirements/fees. your kitty is lovely – I hope to retire from scotland to france in five years time with my two cats , whom i love to bits – max and roger !